Marketing automation is a technology that streamlines and automates marketing tasks so companies can increase operational efficiency and grow revenue faster. But while some companies achieve amazing ROI (100%+ improvements) from marketing automation, others achieve more modest gains, and a few fail to get value at all. Summarize the key factors beyond the technology that drive maturity and ROI. Consider just a few studies. 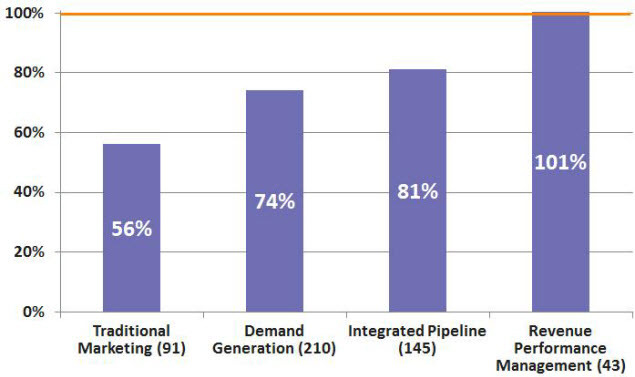 Companies that use marketing automation source more pipeline from marketing, have more productive sales reps, and experience better revenue attainment. Companies that use marketing automation are more likely to report faster growth than non-marketing automation users. 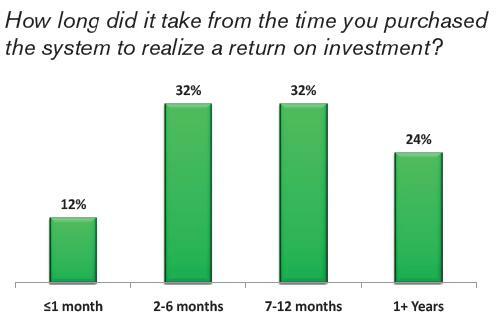 The majority of companies see ROI in less than one year. But Are Companies Getting Maximum Value? However, even those who achieve positive ROI believe they can do even better. While nearly 70 percent of respondents to the 2011 Focus survey noted that their marketing automation solutions met or exceeded their ROI expectations, more than half of survey respondents still claimed their businesses have not realized “the best value possible” from their marketing automation systems. According to SiriusDecisons, only 15% of marketing leaders who have marketing automation believe they are using it to “the fullest potential”. 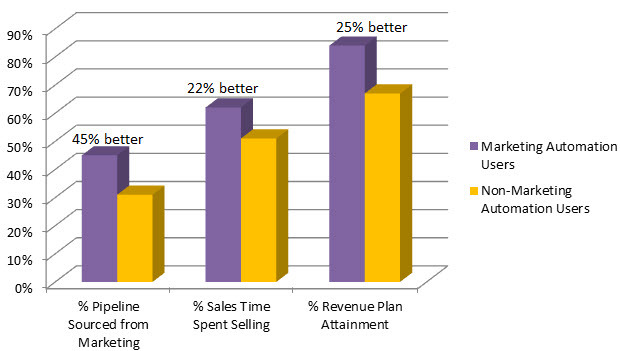 So some companies achieve dramatic ROI from marketing automation while others do not. This variability occurs even when two different companies use the marketing automation vendor. Given the fact that they are using the exact same software, why does Company A achieve such amazing results when Company B does not? Different companies achieve different levels of ROI from marketing automation because of different levels of maturity in their processes, systems, and skills – in other words, in how they use the software and where they are in their adoption. The Marketo Benchmark on Revenue Performance identified four levels of maturity, with the majority of responders in the two lowest levels. The Benchmark study found that this maturity had a significant impact on an organization’s results. In fact, the most mature users of marketing automation achieve 32% greater revenue versus their plan than average companies – and a whopping 79% more than the least mature companies. 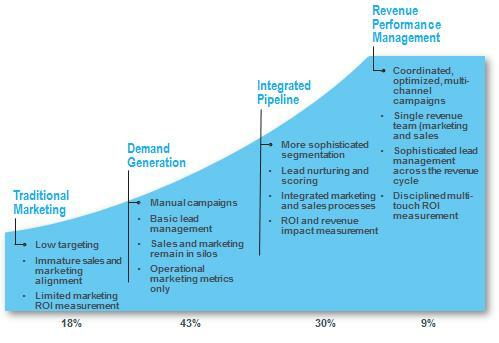 Marketing automation maturity also has a very significant impact on conversion rates throughout the revenue cycle. If marketing automation maturity is the key driver of ROI, then what are the factors that drive maturity? So, don’t just automate your old processes when you are introducing marketing automation into your organization. New technology requires new ways of doing things. 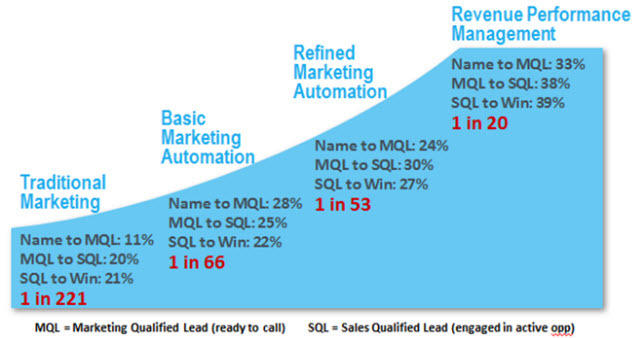 What defines a sales-ready lead? How does your lead qualification team prioritize their time? How will you implement lead nurturing for leads that are not yet ready? How will sales leads that don’t move forward get recycled? 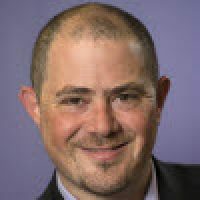 What service level agreements (SLAs) will there be regarding lead follow-up? Marketing automation can drive the most results when a company uses it as an opportunity to realign its entire revenue engine around the modern customer’s new buying cycle. What key metrics do you report on a weekly, monthly, and quarterly basis? How do you measure campaign ROI? What key performance indicators (KPIs) will you use to determine if your revenue processes are on track? With marketing automation, marketers can look beyond traditional metrics (clicks, opens, etc.) and starting measuring (and forecasting) what executives really care about: current and future pipeline, revenue, and profits. Do you have dirty data full of duplicates and bad records? How will your data get cleansed – and maintained – to ensure your marketing automation doesn’t suffer from “garbage in, garbage out”? Quality data is an essential underpinning of any successful marketing automation implementation. What is your content calendar? Do you have content for each stage of the buying process, by persona? Having enough content is often the most underestimated challenge for successful marketing automation; simply put, content is a must-have for consistent lead generation and nurturing. In turn, this requires a solid understanding of your buyer personas so that your content and messages resonate with your audience. Without this, even the most finely crafted marketing automation programs will fail to deliver results. The first step in ensuring your company has the right processes is to expose your team to new ideas and industry best practices. Encourage them to read blogs, follow experts, attend webinars, and when possible, participate in your vendor’s online community, user groups and annual user summits. The more they are exposed to new ideas, the more likely they will be to drive best practice for your business. People – your internal employees as well as external service providers – are the most critical aspect of success with your marketing platform. Business processes design and implementation. Can they envision demand generation and lead-lifecycle processes that align to today’s modern buyer? Can they work cross-functionality to implement across the organization? Analytics. Do you have someone who can absorb, visualize and discuss large amounts of data and complex concepts, and make decisions to solve problems that make sense based on the available information? Technical aptitude. Marketing is increasingly becoming a technical profession that includes proficiency with marketing automation platforms. This represents a huge shift in the job description of a marketer, which previously required little to no technical abilities. Although marketing automation platforms like Marketo are much easier to use than previous systems, users still need to be comfortable using technology. Basic levels of technical acumen are a must; having a “marketing technologist” on staff is even better. You’ll need to evaluate the skills of your team. If you don’t have the right skills on-staff, you’ll need to augment your current staff with training, external consultants, and/or additional hires. Most categories of enterprise software are “all-or-nothing propositions” that require you to fully implement the new system, transforming your processes completely. But a marketing automation platform is different. Marketing automation can deliver fast results – but then requires ongoing usage and adapting business processes to get full benefit. The most successful users of marketing automation have a big vision for what they want to do, but deliver fast ROI and then evolve from there to drive maximum value.